May 8, 2011 - The United States is facing a pivotal time in aviation history. We are charting the transformation of our air traffic control system from the ground-based radar system of the past century to the satellite-based system of tomorrow. We want to make certain our aviation system remains the safest in the world. But to accomplish our goals, the Federal Aviation Administration needs a multiyear reauthorization bill. Reauthorization would allow us to help airports move forward with important safety improvements, which have been put on hold because of uncertainty about long-term funding. For example, we could help airports finance special runway safety areas made of soft, crushable concrete that can keep passengers safe if an aircraft overshoots the runway. This prevented what could have been a serious accident in West Virginia last year. The material stopped the plane and all passengers exited safely. It?s difficult to manage large-scale, long-term programs when there?s only enough money to pour 50 feet of concrete at a time. And it costs a lot more that way ? meaning we get less bang for the buck. The FAA has not had a steady source of funding for 3? years, relying instead on 18 short-term extensions. Some kept the agency running only a few weeks. Debates over aspects of the FAA?s reauthorization bill have led to a political impasse. Now its authority to operate is set to expire at the end of May. With a multiyear reauthorization, airports could make better plans to resurface runways and avoid crumbling pavement. They could better maintain proper signs and lighting, build safer taxiways and acquire equipment to prevent snow and ice buildup on runways. Aviation is an economic engine for America. It adds $1.3 trillion to our economy. It accounts for more than 11.5 million jobs and $396 billion in wages. These are good jobs that Americans have the skills to achieve. The FAA forecasts significant growth in aviation over the next two decades, as the number of passengers on U.S. airlines increases by about 75 percent from today?s levels. In the next 10 years, we expect to reach the milestone of 1 billion passengers annually. We are in the middle of an ambitious effort to transform the nation?s aviation system to meet the needs of the future. We have to do the long-term planning to accommodate this growth ? and build the infrastructure to handle the Next Generation air traffic system. The future of aviation is NextGen. Travelers will see fewer delays. Aircraft will burn less fuel, and air travel will be friendlier to the environment. NextGen is the transformational technology that will take us from radar scopes to GPS-based navigation. It?s the switch from 1950s-era computer systems to Internet-based networks. It?s like the upgrade from a black-and-white TV with rabbit ears to an HDTV. Delaying infrastructure investments, both on the ground and in NextGen technology, means that the long-term cost to our nation ? to our passengers and our environment ? could far exceed the cost of going forward today. While the FAA has, unfortunately, made headlines recently because of a few air traffic controllers who behaved unprofessionally, we have tens of thousands of dedicated employees who work tirelessly to improve our air traffic system. We are making the necessary safety changes so that we give the best performance day in and day out. We are moving forward, and we need support. Both the House and the Senate have passed FAA reauthorization bills. However, the funding levels in the House bill are well below what President Barack Obama proposed in his budget. Funding at these levels would degrade the safe and efficient movement of air traffic today and in the future. The safety improvements we need would be that much harder to make. Since the start of commercial aviation, the United States has been ahead of the world in both safety and breadth. We should not fall behind now. Ray LaHood is secretary of the Department of Transportation. 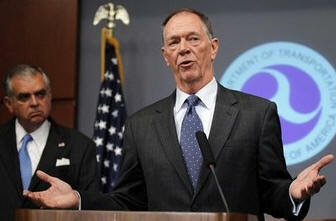 Randy Babbitt is administrator of the Federal Aviation Administration. Flight Attendants Indict American Airlines Top Execs With ?Moral Contempt?